AQSIQ laboratory boasts the ability to issue (GB-CHINA) Laboratory certificates to companies and individuals exporting food and feed products to the Republic of CHINA. AQSIQ laboratory in 2002 became the first official laboratory to be approved by the China Food & Drug Administration to test for pesticide residues and Food Microbiology, this scope was broadened in 2009 to include testing and certification in the fields of nutrition, food supplements, and Food Chemistry Analysis. 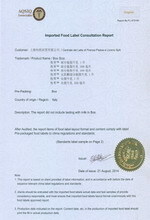 AQSIQ laboratory issued of test report with chinese version will be recognized in every port of CIQ China. EMSL offers a variety of specific food analysis to determine adulteration..
Food microbiology and chemistry analysis – Food adulteration, GMO, Quality control – Natural toxins – Nutritional analysis – Food allergen analysis. Laboratory report by AQSIQ Association and use of the recognised AQSIQ marks will enable you to enhance confidence in your products, give you the edge over competitors, and open up CHINA markets.